Welcome to the official website of Jeffrey Lovett, author of numerous plays, novels, radio dramas, short stories and children's fiction. Here you can find everything you want to know about Jeffrey, read samples of his writing and get further information. Jeffrey Lovett Has a New Play for Youth! The Worst Play in the World now available for Spring 2015 bookings. The Drama Club at Millard Fillmore High School performs nothing but Shakespeare. No musicals, no light comedies- just Shakespeare, semester after semester. But when the Drama Instructor announces that the spring play will be Macbeth, the students have finally reached their breaking point. They can no longer put on tights and recite lines they don’t understand. They must cure their teacher of her obsession with Shakespeare once and for all. So, they hatch a plan to destroy Macbeth and produce the worst play ever staged. The students rewrite the script and hold secret rehearsals in anticipation of presenting one glorious night of rebellions mayhem. Just as they are ready to take the stage, the Drama Instructor announces that a special guest will be attending the performance- a drama professor from State College who is awarding scholarships to promising young actors. Will the group scrap their plans for mayhem and present a traditional rendition of Macbeth? Or will they go through with their plans to make a mockery of Shakespeare and jeopardize their futures? The Worst Play in the World is an hilarious twist on an old classic that will have former drama students wondering why they didn’t think of this first. Read a perusal copy of THE WORST PLAY IN THE WORLD by clicking HERE. 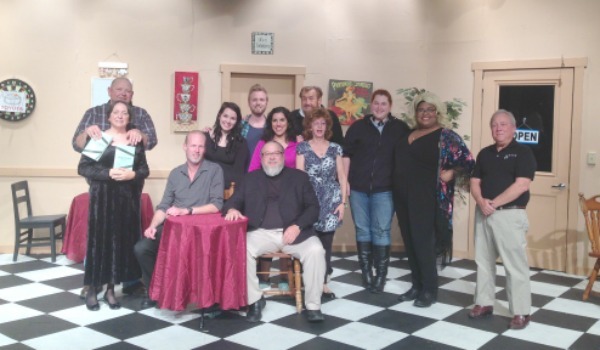 Jeff Lovett's new comedy was met to great excitement during its recent debut at TOSAC. For six nights, the show was sold out and if not for a scheduling restriction, the show would have been held over for another two weekends. The original cast included TimGreen as Commander Dirk McCoy, Sarah Gardner as Captain Samantha Daniels and Marshall Singletary as the Voice of Mission Control. 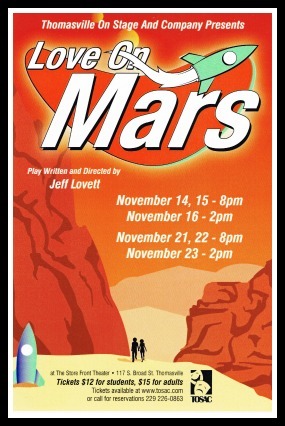 Read Love On Mars now. Just click here. Jeff Lovett recently attended the Florida debut of his play, Simply Divided, at the Lake Wales Little Theater on January 10th. The show was a great success and ran for three consecutive weeks to standing room only audiences. Thank you to Director Ken Bledsoe and the cast for a great show and for inviting Jeff to be there for the Florida premier of his hit comedy. 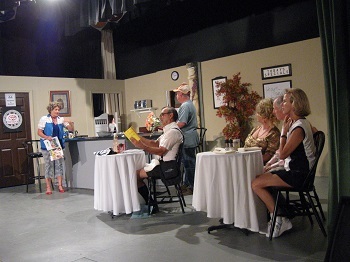 Jeff Lovett (seated center) with cast of SIMPLY DIVIDED at the Lake Wales Little Theater. 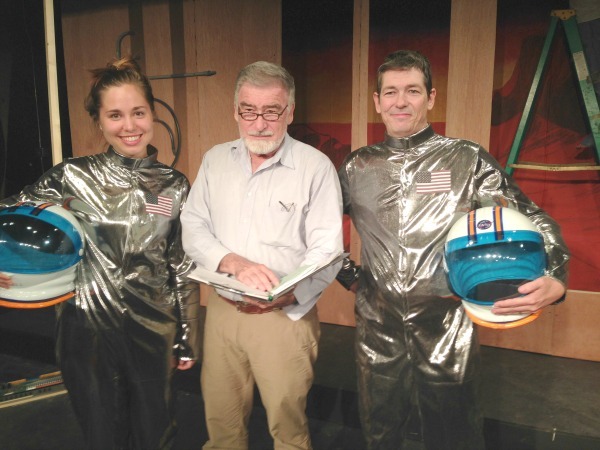 Simply Divided is Becoming One of the Most Popular News Plays Being Performed in Community Theater Across the U.S.
Jeffrey Lovett's play, Simply Divided, has been picked up by more than a dozen community theaters for performance in the coming year. This hilarious 'Southern' comedy has now been performed in Georgia, Alabama, Florida, South Carolina, North Carolina, Virginia, New York and California. If you are looking for a great play to anchor your season, request your free perusal script by click here. 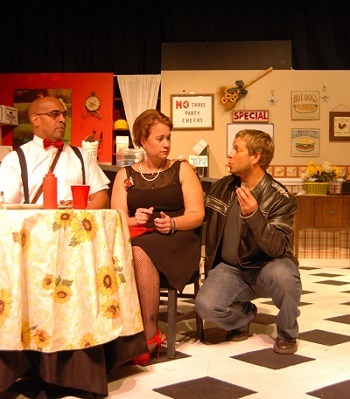 Simply Divided being performed at the Gallery Theatre in Ahoskie, NC.